Showing the front windows overlooking the Tyne, and the auditorium balconies, with the arch of the Tyne Bridge visible in the distance. 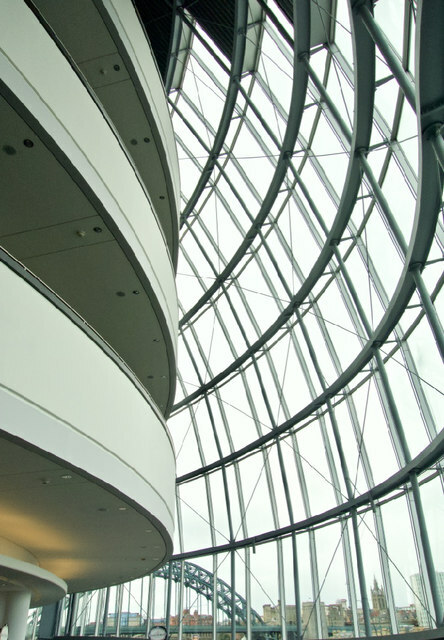 The Sage Link occupies a curved glass and stainless steel building designed by Foster and Partners. It contains three performance spaces; a 1,700-seater, a 450-seater, and a smaller rehearsal and performance hall, in separate buildings, insulated to prevent noise and vibration travelling between them. The Sage hosts concerts from a wide range of internationally-famous pop, rock and jazz artists, and is home to Royal Northern Sinfonia.